Manila, Philippines - Team Lea's young artists continued "The Voice Kids" Philippines Battle Rounds on Sunday, June 29, 2014. It was a battle of vocals between Angelique Trinidad, Rein Pineda and Jimlord 'Jimboy' Garcia as they performed "Anak ng Pasig". Coach Sarah chose Rein while Coach Lea picked Jimboy as the winner in the three-way battles. He will advance to the next round of the competition – the Sing-Offs. On Saturday, other young artists who received nod for 'Sing-Offs' phase were Tonton, Eufritz, Darlene and Angel. Coach Lea had selected the groups of artists who have competed and the songs they had performed in the Battles. After the Battles, vocal showdown of Team Lea's top 6 artists was featured in the Sing-Offs, which cut down the team to its Final 2 artists. 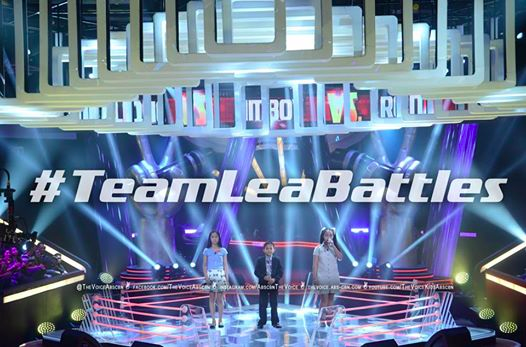 The episode of The Battles on Sunday dominates online conversations with '#TeamLeaBattles' and 'Go Jimboy' among the trending topics. Don’t miss “The Voice Kids” on Saturdays, 6:45 PM and Sundays, 7:30 PM on ABS-CBN’s Yes Weekend.